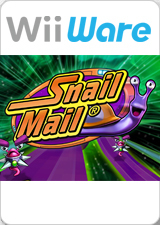 Guide Turbo the Snail as he rushes to deliver Intergalactic mail to the farthest reaches of the universe in Snail Mail, a fast-paced racing adventure for the WiiWare service from Sandlot Games. Navigate 50 adrenaline-packed levels of high-speed action in Postal mode, put your stamina to the test in the infinite levels of Challenge mode, or go for the fastest delivery time in Time Trials. Up to four friends can challenge each other in multiplayer mode. Strap yourself in and take off on an interstellar joy ride. The graph below charts the compatibility with Snail Mail since Dolphin's 2.0 release, listing revisions only where a compatibility change occurred. This page was last edited on 23 January 2018, at 05:22.